After the disappointment of Monday night, Spurs are no longer fighting for the title and are solely interested in finishing above rivals Arsenal. Meanwhile, Southampton have an outside chance of Europa League football and will be keen to enhance their claims this weekend. Although they will be disappointed about missing out on the title, Tottenham should be proud of their accomplishments this season, and with Mauricio Pochettino looking set to sign a new deal, the future looks bright for Spurs. Southampton will also be happy about their season having once again challenged for European positions, proving that they can recover from selling their key players. The coming summer is crucial for Spurs as they attempt to build a squad capable of challenging for the title on a yearly basis. The Premier League should be interesting next season with Pep Guardiola confirmed as Manchester City manager, and Jose Mourinho being heavily linked to the Manchester United job. They have a good core to their team with Hugo Lloris, Toby Alderweireld, Jan Vertonghen, Moussa Dembele, Dele Alli and Harry Kane. If they build on that this summer and add proven Champions League quality, they can become a force both at home and on the continent. Southampton have improved year on year since arriving in the Premier League and many doubted their ability to repeat last season’s success. Despite a wobble during the middle of the season, Southampton remain in the European hunt with two matches left and that would be a significant achievement, especially after losing Morgan Schneiderlin, Nathaniel Clyne and Toby Alderweireld last summer. They have shown that their scouting network is still as good as it has ever been and there will be hope that the club can build once again this summer. There is a danger that the likes of Sadio Mane, Graziano Pelle and Victor Wanyama could move on this summer, but they’ve all be inconsistent this season and are certainly replaceable going forwards. In the earlier meeting between the sides this season, Spurs ran out 2-0 winners with goals from Harry Kane and Dele Alli. Meanwhile, in the corresponding match up from last season, Tottenham were also victorious, thanks to a single goal from Christian Eriksen. Since returning to the Premier League, Saints have yet to beat Tottenham and they have just one draw from seven matches. This is a fixture that Spurs normally dominate and they will be hoping that continues this weekend. Tottenham’s four losses have come when Moussa Dembele hasn’t started. The Belgian will be missing this weekend. Southampton have only lost once in their last eight matches as they look to finish the season strongly and qualify for Europe for the second successive year. Harry Kane has had another superb season, and has emerged as a potential leading star of the league. He is set to finish the season as the league’s top scorer and he will be keen to confirm that with a couple more goals in his two remaining matches. The Englishman will also be looking to go into his first major international tournament in great form. There is an opportunity for Kane to make a name for himself this summer and come out with his reputation enhanced across Europe. At the age of 22, Kane has the world at his feet, after successive seasons of breaking the 20 goal barrier in the league. He currently has 25 goals and one assists this season. If there is one area of his game that needs improving, it is his creative side, as he can be too selfish in the final third at times. Southampton have a good defence, therefore Spurs will need their leading man to be on top form to pick up a victory and confirm second position. Sadio Mane is one of the few Southampton players who may leave the club this summer. Manchester United have been credited with a long term interest, while noises from the player’s camp suggest he would be open to a transfer at the end of this season. He has been inconsistent this season, but a return of ten goals and six assists remains impressive. Last weekend, he bagged a well taken hat-trick against Manchester City, which showed his ability in the final third. Mane is a strong finisher, and enjoys running with the ball at his feet using his skill to beat defenders. Tottenham will be missing Moussa Dembele this weekend, and Mane will be crucial in taking advantage of that, exploiting the gaps left in front of the back four. Danny Rose and Toby Alderweireld are both doubts for this weekend after taking knocks in the Chelsea match. Nabil Bentaleb is set to miss the match with a knee injury. Dele Alli and Moussa Dembele are both suspended. Southampton have no injuries heading into this weekend, which should see them field a full strength side to try and further their European ambitions. Charlie Austin and Jay Rodriguez could both play a part to aid their recoveries from injury. I think this will be a very entertaining match, typical of end-of-season affairs. There will be goals and Southampton should be confident of taking something from the match, especially with Moussa Dembele missing. The Belgian has been an unsung hero for Spurs this season, providing cover to the back four and playing a crucial role in the transition play. Harry Kane will be eager to add to his goal tally for the season as he attempts to finish the year as the league’s top scorer. I think this will be a score draw. 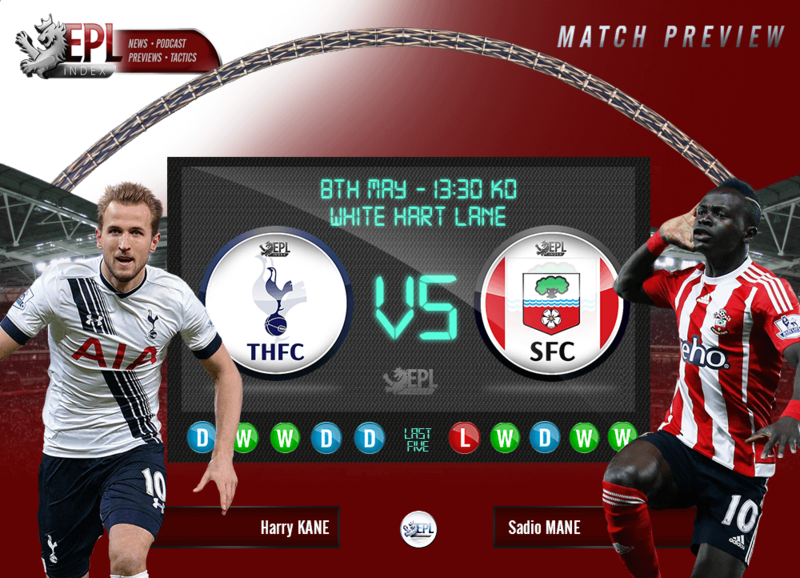 Categories: EPL Index Featured Article, EPL Index Match Previews, Southampton, Southampton (NN), Tottenham Hotspur, and Tottenham Hotspur (NN).' 'Tags: Arsenal, Dele Alli, english Premier league, English Premier League Stats, EPL, EPL Index, EPL Index Match Previews, EPL Match Preview, EPL Stats, EPLIndex Match Preview, EPLIndex Match Previews, Europa League, Harry Kane, Hugo Lloris, JAN VERTONGHEN, Mauricio Pochettino, Mourinho, moussa dembele, nathaniel clyne, Pep Guardiola, premier league, Premier League Match Preview, Premier League Stats, Sadio Mane, Southampton, Spurs, Toby Alderweireld, Tottenham, and Tottenham Hotspur.